With Tuesday’s 4-0 home win over reigning Great Basin Conference champion Burley, the Wood River High School boys’ varsity soccer team served notice that it’s ready to step up and compete for state. The Wolverines (1-0-2, 1-0-0 league) did it with an attacking offense and a stifling defense that hasn’t allowed a goal in 240 minutes over three games. Burley fell to 1-2-0 (0-1-0 league). Seniors Alex Lopez (2 goals) and Zack Freeman tallied the first three goals, and sophomore Sage Kelly the last one. Senior Trevor Brand led the defensive charge and junior goalkeeper Max Mauldin (4 saves) recorded the shutout. Wood River outshot Burley 7-1 in the first half, 12-5 for the game, and scored its first goal of the season at the 35-minute mark on a play originating at midfield with the deceptive speed of left defensive back Freeman. He dribbled down the left side past two Bobcats and served a pretty ball to Lopez, who fended off a defender and scored into an open net. At 60 minutes, Wood River converted a set play when senior Cole Caminiti dished a corner kick into the box and Freeman headed it home nicely. Lopez picked up a loose ball and left-footed the third goal at 74 minutes, and Kelly floated home a long shot from the right flag for the 4-0 final. “We pushed the offense when we needed to and got back on defense—really playing like a big unit, like the motto we have on our T-shirts. Our guys coming in from the bench stepped up and were really solid,” said Monjaras. Equaling the most goals they’ve ever scored against the ’Cats, the Wolverines are now 18-16-5 in the 39-game series with Burley dating to 1994. And they’re 6-2-3 against Burley under fourth-year coach Monjaras, after going 2-11-0 against Burley teams from 2004 to 2008. 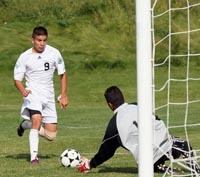 Wood River played at Canyon Ridge (0-2-1, 0-1-0 league) Thursday and visits Jerome (3-0-1, 1-0-0) next Tuesday. Jerome beat Canyon Ridge 7-1 Tuesday. On a stifling hot day in Burley, the Wood River girls (2-1-0, 1-0-0 league) won their first GBC game 8-0 over the Bobcats. Scoring two goals apiece were Grace Eagan, Allison Gasenica and Lucy Brannon, with singles tallied by Tayte Kelly and Telar McClure. Assists went to Haley Montgomery, Olivia Thornton, Brigette Thomas and Samantha Sutton. The Wolverines hosted Canyon Ridge (1-1-0, 1-0-0) Thursday, the Riverhawks coming off a 3-1 home win over Jerome. Community School girls’ and boys’ soccer teams posted High Desert Soccer Conference wins over the Filer Wildcats on Tuesday and settled into a 10-day break from competition. Coach Richard Whitelaw’s Cutthroat boys (4-1-1, 2-1-1 league, 22-6 goals against) posted their first home win of the season 5-0 over Filer. “Man of the Match” was sophomore Jack Swanson. Goal scorers were Bobby Corker, Cameron Jenner, Mason Noyes and, with his first varsity goal, Keegan Whitelaw. Coach Kelly Feldman’s Cutthroat girls (4-2-0, 4-0-0 league, 35-9 goals against) prevailed 6-1 over Filer with junior Hannah Dies (a team-high 9 goals) scoring her second three-goal hat trick of the season. Other scorers were Ellie Swanson, Lilly Jenner and Hayley Murach. Emily Siegel and Murach each added an assist.